← How to convert a document of mht to wmf image? 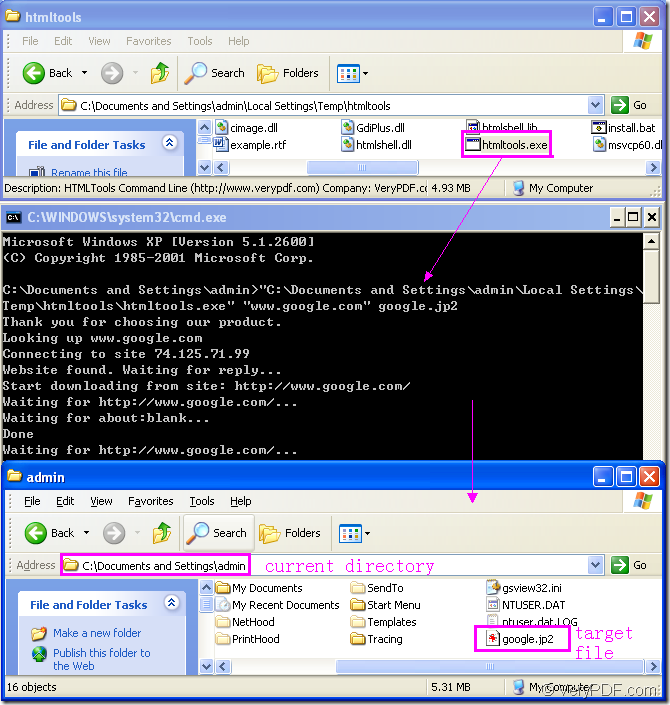 You can see Figure1 which shows the main process of the conversion of url to jp2 format.The first dialog shows the software,also the called program you should use in this conversion;the second dialog shows main converting steps,while the third shows the location where the jp2 file,also the target file is saved. This article will explain Figure1 for you step by step. You should choose a suitable software to convert url to jp2 format.HTML Converter Command Line is a very powerful converting software which can create previews or thumbnails of web pages in a number of different formats, such as TIF, TIFF, JPG, JPEG, GIF, PNG, BMP, PCX, TGA, JP2 (JPEG2000), PNM, etc. It also allows you to convert web pages to PDF, PS (postscript), WMF, EMF vector formats. The Command Line application is very convenient only by inputting some easy DOS commands,which can save your precise time.It can be called from within ASP, VB, VC, Delphi, BCB, Java, .NET and COM+ etc. program languages. It uses advanced techniques to allow efficient asynchronous multithreaded operations. You can download HTML Converter Command Line at the website http://www.verypdf.com/htmltools/htmltools.zip. There are the introduction about the software at http://www.verypdf.com/htmltools/index.html. If you want to know more functions about HTML Converter Command Line, you can read its user manual at http://www.verypdf.com/htmltools/htmltools-manual.htm. There are two steps in the conversion of url to jp2. You can run cmd.exe by clicking “start”—“run” and input “cmd” in “open” edit box of the popup dialog box.Then click “OK” button of the dialog.You can also press “Windows”+ “R” at the same time on your keyboard to open cmd.exe program. htmltools.exe is the called program which in framed by the pink rectangle in the first dialog of Figure1.It the executable file of HTML Converter Command Line. http://www.google.com is the source file.You can input the URL of some webpage in the command line.When you run the conversion,the called program will find the URL via Internet automatically. "C:\Documents and Settings\admin\Local Settings\Temp\htmltools\htmltools.exe" is the path of htmltools.exe.You can drag the file into cmd.exe dialog box directly to avoid inputting or remembering the path by mistake. 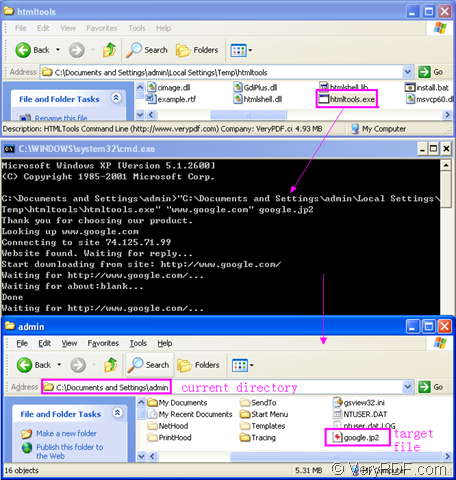 "www.google.com" is the URL of webpage which you can input in by yourself or copy the URL and right click your mouse in cmd.exe dialog box which means “paste”. google.jp2 is the name of target file.You can set the location for the target file here such as C:\google.jp2.Then the file will be saved in root directory of C disk.If not,the file will be saved in current directory by default. You can find the target file in current directory because you didn’t specify the location for target file in the command line.Then you can browse the file by some kind of viewer such as IrfanView,GSview,ect. The steps of converting url to jp2 are very easy,aren’t they? How to rotate the page while converting url to jp2? How to rotate the page while converting url to wmf? How to rotate the page when converting WMF to PNM? This entry was posted in HTML Converter (htmltools) and tagged url to jp2. Bookmark the permalink.